I’m a lover of gadgets, and especially new technology. ‘Wearables’ is a buzzword in the tech world these days. 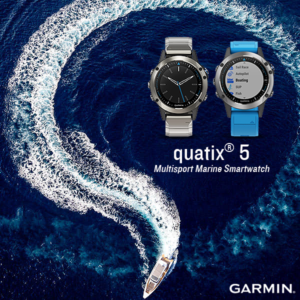 The latest offering from Garmin, specifically a wearable designed for sailors, is the Quatix 5. This is more than just an upgrade on the popular ‘Quatix 3’. The Quatix 5 is built on the popular and widely regarded ‘Fenix’ platform. To start off, I was given the Fenix 5 ‘Sapphire’ variant for two weeks to test, and that is what this review is based on. There is really no difference between the ‘Sapphire’ and the regular model when it comes to operating system. The major change between the ‘Sapphire’ and the regular one is all about the glass that’s used for the watch face, and the band that comes bundled. The Sapphire uses, you guessed it, Sapphire glass for the watch face. This is touted to be far more resistant to scratches. In the two weeks I had the watch, I didn’t manage to scratch it. So either this was doing it’s job, or I was looking after it well! I will, however, say that on my other Garmin watch that doesn’t have Sapphire glass, I’ve had it for two years and only recently did I pick up a minor scratch. Regardless, the watch is a thing of beauty. With the metal wrist band, the watch is an elegant accessory that can be worn with your suit or executive outfit and not look like it’s also your sailing watch! One feature I really enjoyed was the ‘Quick Release’ system for the bands. My gripe with the older Quatix 3 model was that if I wanted to change from the executive looking metal band for the more sailing orientated silicone band, it was a labourious task that involved unscrewing tiny screws, changing bands and re-screwing them back into the watch. With the Quick Release system, changing bands literally takes seconds, and allowed me to go from the full metal band I had on for a morning meeting, to the catchy blue silicone band when we went for a sail that afternoon! The Quatix allows you to customize the digital watch face to your hearts content. The possibilities are practically limitless. 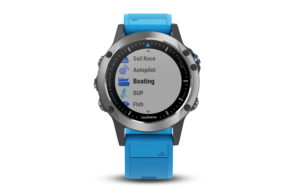 Despite all the built in options, from elegant analog faces to more boat-practical digital faces, there are thousands of ‘custom’ watch faces available on the Garmin Connect app store. 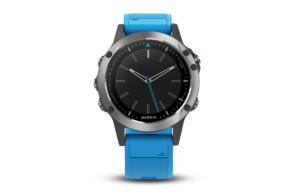 This is an app store built by Garmin, specifically for it’s wearable products where developers and enthusiasts can design and build watch faces, apps, widgets and more! So if you don’t find something pre-loaded that you like, you’re sure to find something popular on the app store that gives you the look and information you’re after. No Smart Watch would be considered ‘Smart’ if it didn’t interface with your phone. The Quatix connects seamlessly via Bluetooth to the Garmin Connect app. From here you can sync data between the devices and into the cloud. You can also control many of the settings on the watch from here. While the app is not required for operation, it certainly completes the experience and makes it that much more useful. One of the big upgrades from the 3 to the 5 is the addition of the built-in, wrist based Heart Rate monitor. This is a popular feature across any new smart watch these days – with the fight being to keep its size down. On the Quatix, it’s basically flush with the bottom of the watch, so there’s no funny sensor protruding out the base and being uncomfortable. This tracks your wrist based heart rate 24/7 – a popular feature these days with activity tracking. The watch also counts your steps, floors climbed and a plethora of other metrics, all under the banner of ‘Activity Tracking’. 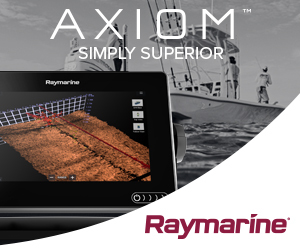 All of these great features, are, in theory, peripheral to the actual marine features of the Quatix 5. The Quatix is specifically designed for water and marine environments. 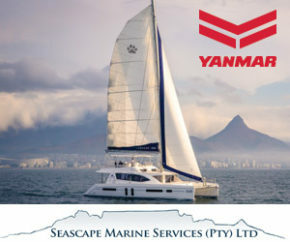 It connects seamlessly with compatible Garmin chartplotters and other Garmin instruments and auto pilots. This provides the ability to carry out many functions straight from the watch. For example one can control an auto pilot and mark way points. All instrument data can be streamed to the watch, making it extremely useful for crew who have no vision of the instruments, but need to know numbers like time to the mark. 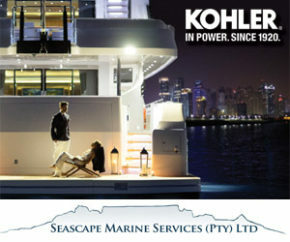 Taking control from anywhere on board is great, especially when taking control of the auto pilot on board when cruising. Simple adjustments to the heading can be made without getting up from what you’re doing. There’s also a built in ‘FUSION-Link’ app for connecting to the increasingly popular and compatible Fusion Marine Entertainment systems, as well as other ANT-enabled stereos. 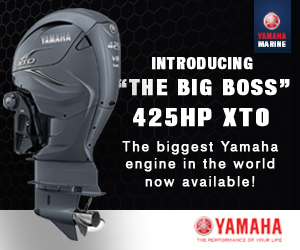 Again, this means simple control of your entire entertainment system from your wrist, anywhere on the boat! Another significant upgrade from the Quatix 3, is the ‘Virtual Startline’. With the Quatix 3, the startline info was great. But it was just a bunch of numbers. On the Quatix 5, you don’t just see the numbers, you can see a visual – ie. A virtual startline on the watch. You’ll still get all the usual information, such as distance and time to the line or the ends. Obviously time to burn is still one of the main data fields for any starting programme. The Quatix 5 will still give you all this information in conjunction with the virtual starting line. There’s an improved ‘Tack Assist’ feature. 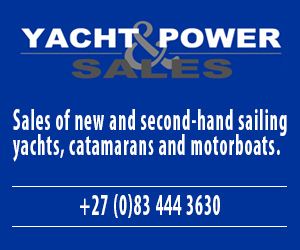 This feature allows you to easily calibrate the boat’s port and starboard tack angles, and then get alerted when the boat is being lifted or headed, and by how much. One thing I’ve always loved to do is collect and analyse data. The Quatix will log all this data coming into it as an ‘activity’ which you can then go back to later for analysis. It’ll even log your data such as heart rate, so you can see how well you managed in those hairy moments! 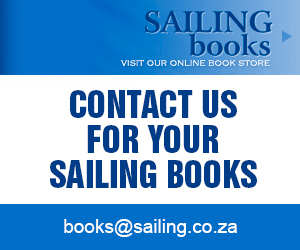 Besides sailing, there are many other ‘Apps’ for other water sports. Each of these give different data based on the activity and how you’ve set it up. For example there are apps for stand up paddle-boarding, or canoeing or waterskiing (as well as many others I’ve not mentioned). Each one of these provides wrist-based metrics specific for the activity you’re doing, as well as logging the information with its incredibly accurate GPS. Besides the marine features, the Quatix 5 has all the functionality of the normal Fenix 5, which is designed for the multi-sport enthusiast. This makes tracking things like hiking, running or cycling a breeze from the exact same watch that you use for sailing! The Quatix 5 also has a built in remote control for Garmin’s Virb line of action cameras. This again means you can control these remotely. Very helpful when the camera is out on the end of the boom! All these great features do, unfortunately, come at a cost. At the time of writing, the base/normal Quatix 5 retails for about R10 500, while the Sapphire variant with metal band retails for around R14 000. Overall, Garmin continue to make great strides in both the marine and sport markets. The Quatix 5 is a step forward in meshing these two markets together, and attempting to make a single device available for people who want to use the device in more than one environment. There’s no doubt that it’s an expensive bit of kit, but when you extend its use to more than just on board, it starts to become more affordable. 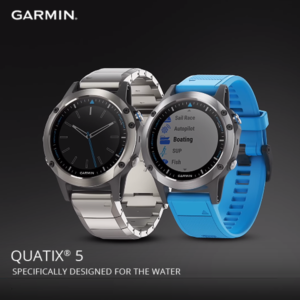 In this new world where activity tracking, step counting and comparing your activities with your friends, there’s no doubt that Garmin’s watch line, and especially the Quatix line, are one of the better offerings out there.